There seems to be a new issue in the offices of many psychotherapist around the country. 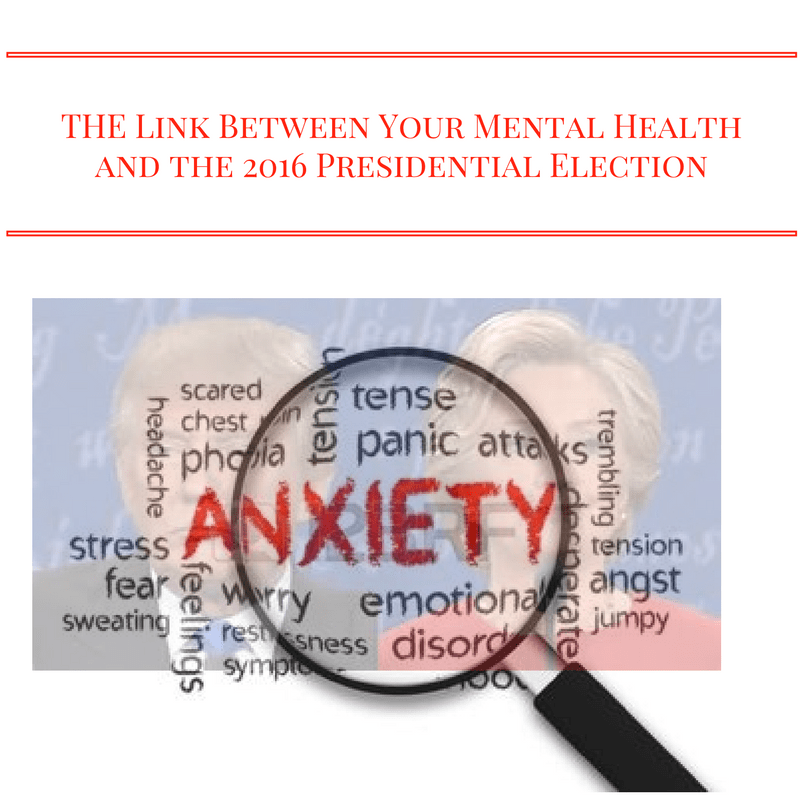 People are coming to therapy to discuss the connection between their mental health and the 2017 Presidential election. People are reporting a mental health decline since the election, marked by intense sadness, fear, and anger. Our relationships with family and friends are taking a hit as well. The discord in inter-personal relationships make us feel more isolated, invisible and alone which intensifies these emotions. These “clinical issues” are certainly not new for therapist. However, a collective emotional reaction being triggered by a presidential election is a new phenomenon. If you have been a victim of, or witnessed acts of violence such as sexual assault, bullying or racial discrimination, re-exposure to a similar threat can trigger responses associated with the fight/flight/freeze response such as fear, anger, or sadness. For example, the sexual predatory language used by President Elect Donald Trump may trigger a Post-Traumatic Stress Disorder flavored reaction for women who have been sexually assaulted. The same is true for victims of racial discrimination and bulling. The exposure to the recent racially charged acts of violence can trigger a fight/flight/freeze response in those who have been a victim or or witnessed this type of violence. If you have felt emotional upset by recent current affairs, this does not make you weak or thin-skinned. Don’t buy into this perspective which only re-victimizes the victim. Although you may have been victimized, you are still responsible for your own actions, thinking processes and how you regulate your emotions. Victims have a responsibility to understand and take care of the part of themselves that is wounded. When we begin to feel in control again, our sense of autonomy, confidence, and self-mastery is enhanced. Walking a path that empowers, although not easy, is the path which leads to healing. Engage in Self-Care – Do the things that make you feel cared for. Approach yourself with the nurturing love of a mother or father that protects, heals and soothes. Self-care does not mean you must spend a lot of money. Self-care might include subtle actions such as speaking meaningful words of affirmation and encouragement to yourself. Therapy – Release some of the pain by talking about it. Express your emotions. Therapist are trained to help us understand how we internalize emotions in a hurtful manner such as self-blame. If you cannot talk to a therapist consider a faith leader, a trusted friend or family member who will listen with compassion. Master Yourself – Every long journey begins with the first step. Take the first small step to self-mastery. You do have the capacity to feel in control, safe and connected. Take risk and be willing to try new things. There are others out there who have suffered similar traumas, and like a phoenix, they have risen out of the ashes. Unplug – Many of us have become obsessed with the latest political developments. If watching the news upsets you beyond what might feel like a normal response, take a break. Unplug. You don’t have to put your head in the sand or become uninformed, just take a little break. Instead, allow something uplifting to become the object of your mind such as spiritually uplifting material.